Mark relayed that there is nothing on either the House or Senate calendar scheduled. This is a good thing, as every day that passes towards the Dec. 31st sunset date increases the chances that we will get an extension as opposed to a civil liberties crippling bill. Mark also explained that the last extension, passed in similar circumstances, ran one only about a month, so even if there is an extension we should be prepared for it to be short. Mark has also been following up with Alexandra Pelosi’s staff, and the next step in the process is for word of his initial outreach to be passed along via her speaking agent. It is difficult to say for certain how our video projects will progress, but one thing is for certain, is that our networks of online activists present quite a system to promote any sort of video—whether it be a 30 second commercial, 5 minute explanation, or a full documentary. Spreading convincing arguments is activism in and of itself (well, more like citizenship than activism, yet citizenship is something you do), and as we gain traction in these realms we will be moving more and more aggressively to take advantage of the evolution of video. This past Friday, Dec. 11, Julian Sanchez appeared on NRANews.com and was interviewed by Cam Edwards, the host of “Cam and Company”. We tweeted out responses and notes to the interview, but couldn’t encourage all of you to check it out for yourselves. The interview went extremely positively, and Cam clearly understood and supported the rationale for NRA supporters to become involved in this fight. Bridges can hopefully be built here, as this truly is an issue that affects us all! As Korkie emphasized on the call, the holidays are upcoming, and during such times of reflection it’s increasingly important for us to express our abiding appreciation for the help and time from all of our supporters as we collectively strive for true change and work to make our country a better place. Thanks to Korkie, Mark, and Jon for joining the call, and to all of you, without whom, none of this would be possible! We are going to use the comments section of this post to catalog all the varying multimedia at our disposal relating to FISA, the Patriot Act, civil liberties, etc. that might be helpful as we work to produce more video and media content. Help us make this post as comprehensive as possible by posting links to the varying relevant videos and podcasts and such in the comments. While you’re at it, let us know what you think of them and how we may incorporate some of the material, ideas, or principles into our own projects as well! Marcy Wheeler wrote a fantastic post on a report from The Hill over how “the president picked up the phone several weeks ago to find out why Conyers was “demeaning” him.” The Hill discussed the story in context to how it highlights Obama’s sensitivity to criticism from the left, while Marcy wrote about it in regards to Obama’s view that criticisms from even his strongest supporters (chairing congressional committees no less) can be “demeaning”. Conyers is far more than a disgruntled progressive falling out of love with Obama. That said, he is in many ways the archetypal disgruntled progressive. The issues the Hill cites–Afghanistan, health care, Gitmo, and PATRIOT–are many of those that progressive everywhere split with Obama on. Obama was always a hawk on Afghanistan. He was always a moderate on health care reform–though he did campaign on a public option. It’s the latter two issues the Hill cites–Gitmo and PATRIOT–that violate Obama’s campaign stance that “no one is above the law” and that he would revisit FISA immediately (the Administration has rejected such efforts now, including the HJC bill aiming to do just that). Conyers’ complaints with Obama are the complaints we all have. Then again, unlike the rest of us, Conyers is Chair of the House Judiciary Committee, which just so happens to be the committee that oversees these “rule of law” issues. And it’s on that level where the accusations of “demeaning” seem most important. Obama has asked Congress to roll over on issues and, in SJC at least, succeeded in getting top people (like Pat Leahy) to do so. On PATRIOT and Gitmo, Conyers has thus far refused to do so. So who is demeaning whom? If the President demands that a Democrat who has served in Congress since Obama was four years old, one who paved the way on civil rights issues to make it possible to elect an African American man President, and one who played a key role in Obama winning the primary, just roll over on legislative issues, who is demeaning whom? This is an important story in relation to Get FISA Right, as we are also a coalition who have supported Obama yet who have the gall to “demean him” by publicly disagreeing with his stances on the Patriot Act in particular while pushing for him to do better. If the president is making these sort of demands from Chairman Conyers of all people, regrettably, it might shed light on how he currently views our attempts to open up a substantive discourse with him in regards to these policies on which we would like to show him the way. Such an attitude certainly betrays the notion—still expressed at the top of the Organizing for America website—that he is asking us to believe in our own ability to bring change to Washington. However, words have consequences, and the inspiration behind Obama’s words can not be undone. We all must continue to believe that we hold this capacity, and just because Obama is in Washington now (and appears to be feeling its effects) it does not mean that we must go back to believing merely in his own ability to bring change. It is a citizen’s duty to act—as Marcy says, citizenship is something you do—and we all should internalize the belief that YES WE STILL CAN! Bottom line: everybody involved in this fight believes there will be an extension of the Patriot Act that will be continued into next year extending the sunset time for another 3 or 6 months. This was the consensus from the multitude of experts consulted, including a series of legislators Mark was able to get in touch with in the past few days. Republicans and Blue Dog Democrats alike continue to profess their desire to extend current law, as well as the Obama administration speaking through the FBI. For more details, see Mark’s piece on this topic published in the Huffington Post. This is a key element in our effort to transition from being “rabble rousers” to influencing legislation. As Amy has pointed out, we need to start small with local stories in order to build up in the massive way we aim to, and we all must be more conscious of engaging our own state’s politicians as we move forward. Privacy concerns transcend any notions of left vs. right, and most politicians in this day and age claim to be above the fray while speaking for “the people”—especially President Obama. However, both political parties are ignoring the civil liberties consensus amongst their constituents. Bipartisanship does not mean merely Republican and Democratic politicians working together, it is the agreement from the grassroots activists that is so powerful on this issue, and it is our job to amplify the wishes from both sides of the aisle in order to make their representatives bow to the will of the people. What this means for us is that we will be increasing our tangible outreach efforts to the very epitome of strange bedfellows, including conservative groups such as the NRA and liberal ones such as legalization advocates. These two groups in particular are the ones most at risk from Patriot Act provisions such as Sneak and Peek, and this effort represents a rare opportunity to bring such people together in the true definition of a transcendence of partisanship. Amy has been leveraging her local contacts and reaching out to both Sen. Specter and his primary challenger Rep. Sestak’s offices, and today held a meeting with Specter’s legislative aid and chief council to the Senate Judiciary Committee as part of our buildup to ensure civil liberties is a primary element of the Democratic primary campaign. Rebecca emphasized the strong adherence to privacy concerns held amongst Nevada constituents in general, and this combined with Senate Majority Leader Harry Reid’s looming election battle make this another state ripe for us to leverage our issues onto the national stage. Even better, Firedoglake has been exhibiting the degree to which Reid’s dire electoral situation can be leveraged through innovative new media based phone banking to the area pushing him to show true leadership in the public option fight. We feel a focus on Nevada is especially warranted considering one of our strongest allies, #p2 co-founder Tracy Viselli, is a resident and activist in the area. We have two videos we would like to make. One would be a quick overview totaling 3-5 minutes describing what’s the issue, what’s at stake, what do we want to have happen. The other being a 30 second TV ad to put on cable TV through saysme.tv. we will also be establishing a “multimedia library” including all of the available video resources for us to spread and use as inspiration for these projects. Forest, aka tw3k, joined us for this call and suggested we engage further with Google Wave. This could solve our problem of creating a singular place to go that’s easy for anyone to update to see what’s going on for team members and other people working for civil liberties. We had already begun our first attempts at this, including this early attempt at uploading and acting upon our open letter, and we further invite anyone who would like to help out to let us know so we can get them invited to Google Wave and up to speed on how it works! Clearly much was accomplished, yet with all these great ideas we have that much further to go to implement them in order to make the kind of impact that we desire. Thanks to Amy, Mark, Jon, tw3k (Forest) Troy, Korkie, Jim, Kevin, and Rebecca for joining this call, to everyone else following along silently, and as always, to all of our other fantastic supporters without whom none of this would be possible! We are quite excited by the new team members we have been picking up, and also hope older ones continue to come back into the fold as they find projects that interest them and as time becomes available. End-of-the-year Patriot Act strategy thinking … please discuss! Organizing call Tuesday! Please let us know when you can make it! With health care still the focus and now Aghanistan and climate change, and Congress scheduled to recess on December 18, there are starting to be rumors of a “continuing resolution”: extending the sunsetting Patriot Act clauses without modification for a few months. To be honest, though, we have no idea on what the legislative status is. If anybody knows what the heck’s going on, please leave it in the comments. The way it looks to me: the legislative path seems torturous — the bill the HJC reported out still has to go through Intelligence, where Reyes has a competing bill — so a a continuing resolution seems plausible. On the other hand we should also be alert for an attempt to use the deadline to sneak things through without meaningful debate. This was a favorite tactic of the Bush Administration and previous Congress, and as our open letter pointed out so far that’s been a disappointingly accurate guide to how the Obama Administration has approached things. Speaking of which, please sign our open letter via BORDC, change.org, Care2, and/or Twitter. Post it to Facebook and MySpace. Tweet it. Thank you. So strategically, we have to be ready for short-term action while building and planning for the longer term. 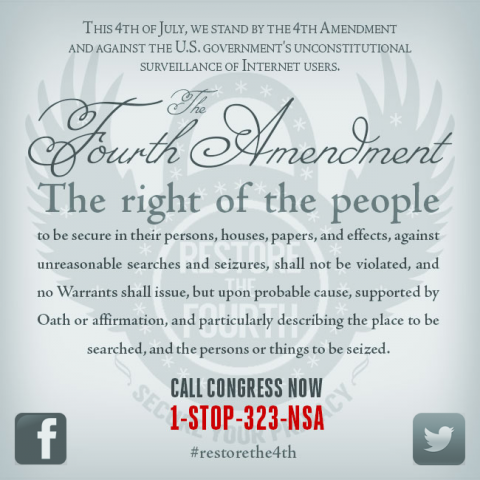 We’ll have an organizing call/chat on Tuesday; check the Patriot Act Action Hub for details. For now, let’s start the discussion. Our best chance for impact in the short-term is probably to leverage a meeting one of our members has on Tuesday with Senator Specter’s people. It’s a great opportunity … how best to capitalize on this? Our tweetchat during the Cato Institute event, The USA Patriot Act: Renew, Revise, Repeal?, was quite instructive as to both the need to fix the Patriot Act and the degree to which more attention (especially from media) is warranted in regards to this issue in particular and civil liberties in general. The event started strong, with Moderator Tim Lynch of the Cato institute describing bluntly that the debate in congress hasn’t been a front page news story because “Obama signaled that he wanted all provisions renewed”. It is a sad state of affairs for our media environment, regardless of what one thinks about the ‘liberal media bias narrative’, that this has come to pass, as there are very few issues in which a bipartisan consensus has been achieved amongst our citizenry as civil liberties. Lynch also specified that it “seems clear that the patriot act will be renewed in some form in the near future. If not, by the end of the year, some kind of extension, early next year”. Julian Sanchez, also of the Cato Institute, worked throughout the debate to “take a step back and put the disparate powers in the context of a larger shift in the contours of American surveillance law.” His argument that we are no longer surveilling “people”, but “populations” is particularly jarring and powerful language. Richard Samp of Washington Legal Foundation argued from a limited government standpoint that “simply because there is the potential of abuse, doesn’t mean we have to add additional layers of bureacracy” while somehow forgetting the layers of public servants necessary to maintain a surveillance society. Much thanks to Jim Burrows for his fantastic work summarizing the notes in the tweetchat into tweets, to Korkie for retweeting vociferously, to Amy for her extensive outreach, to Mark for his coverage, and to Jon and everyone else who participated or paid attention. These tweetchats are not an end in and of themselves, just as the Cato Institute event isn’t either. The key is to change people’s minds and encourage others to become active, all within a focused effort to move congressional legislation while pushing the president to engage. We will continue to hold these events to amplify these arguments while keeping our eye on the larger prize. As Julian argues, we need to take that step back and look at the longer term implications of this massive shift, and adjust our strategies while digging our heels in for the fight ahead accordingly. Our tweetchat during this Cato event really is illustrative of this larger context, as we all must do whatever we can to get the word out as to what is happening—as well as to our leaders to alert them that we are paying attention and intend to hold them accountable to their oaths to uphold the constitution. We are organizing another tweetchat this Thursday 1pm PST/4pm EST during the Cato Institute’s event USA Patriot Act: Renew, Revise, or Repeal?. Once again we will be flocking to the Patriot Act Action Hub to discuss the issues at hand and to coordinate actions encompassing what we can do about it. Anyone can participate by using the chat room in the action hub and/or by tweeting to #patriotact (which are relayed into the chat room as well). It bodes to be an intriguing event including participants across the ideological spectrum. Furthermore, it will be another opportunity to help us spread our Open Letter to President Obama as we engage with others following this issue. You are currently browsing the Get FISA Right blog archives for December, 2009.